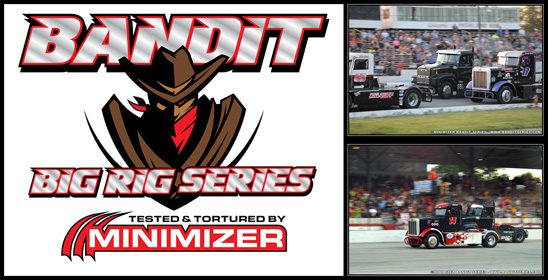 (Blooming Prairie, MN March 7, 2018) – Due to a weekend forecast that features rain, rain, and more rain, the Minimizer Bandit Big Rig Series is moving its season opening race at Mobile International Speedway to March 24th. "This weekend looks like a washout," The Godfather Craig Kruckeberg (#55) said. "There's no doubt it's disappointing, but we have to consider everyone's safety, especially our fans. With the weather forecast being what it is, the best move is to postpone the event until March 24th." The plan ensures that the event at Mobile International Speedway still serves as the season opener. "Our fans in Mobile were really excited about this weekend's event, so moving it two weeks down the road means it's still our 2018 opener, which is really exciting," Bandit General Manager Jason Johnson said. All times will remain the same, with the green flag dropping at approximately 6:30 p.m. on the 24th. The Minimizer Fan Series Truck Show will also start at 2 p.m. that day. Tickets already purchased will be accepted on March 24th. "It's going to be huge," Johnson said. "Even though the postponement is far from ideal, to move it just 14 days on the calendar is a win-win, where the event remains the season opener and our fans in Mobile can celebrate with us."